Description: Helen Merrill, one of my favorite jazz singers of all time, is peculiarly but consistently underappreciated in the United States. Maybe there is something too unique about her otherworldly, husky voice and deliberate, mysterious delivery. Perhaps it's her artistic risk taking that sometimes takes her too far away from the sensibility of mainstream jazz fans. Whatever it is that sets her apart, however, seems to captivate Japanese jazz fans, yours truly included. The evidence is a large body of her recorded work reissued on CD in my country. 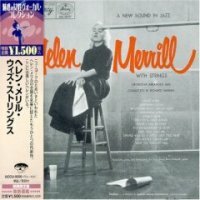 Helen Merrill with Strings is a good example. Recorded for the EmArcy label in 1955, the album features a string orchestra arranged and conducted by Richard Hayman as well as a stellar rhythm section consisting of Hank Jones, Milt Hinton, Sol Gubin and Barry Galbraith. Some selections are unique -- "Lilac wine" and "Mountain High, Valley Low," for example -- and so are her interpretations of well-known standards such as "Anything Goes," "Comes Love" and "The Masquerade Is Over." When she sings these love songs, she transforms them and takes the listener to another world. She injects every phrase with deeply felt emotions and the effect is often devastating. This is a phenomenal work by an accomplished artist. Recorded in New York on October 21, 1955. Originally issued by EmArcy (Mercury Records: MG 36057). This Japanese CD was reissued by Universal Music Japan in January 2007. Mono.